For the service, Beauty Lesha Co., Ltd. of MBC Academy Beauty School is hereby authorized to collect and use your personal information as follows (with agreement required from a legal guardian for a customer who is 13 years or younger). 2. Purpose of collection and/or use : as data for consulting and for promotion. 3. Period of data retention and use : As soon as a specified purpose is fulfilled, data shall be destroyed immediately, while it shall be retained for a year. 4. Right to refuse to agree and disadvantage : A customer can refuse to allow his or her personal information collected. However, in case he or she refuses to agree, a customer cannot use the service. [NEWS] All MBC Academy Beauty Sch..
[NEWS] Beauty School Directs Hair..
[NEWS] MBC Academy Beauty School..
[NEWS] MBC Academy Beauty School .. Does the School offer scholarship or fee discount? 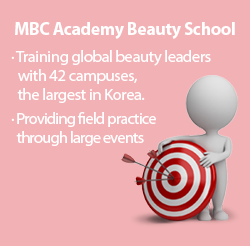 What does MBC Academy Beauty School have to do with MBC? Go to Training for Hong Kong instructors visiting Korea to learn Korean Wave makeup! Sponsored by AMF ! We created the main event, “the Beauty Gala Show”! We created the wonderful fashion show with top designer and models!